For the journal, see Labour Economics (journal). Labour economics seeks to understand the functioning and dynamics of the markets for wage labour. Labour markets or job markets function through the interaction of workers and employers. Labour economics looks at the suppliers of labour services (workers) and the demanders of labour services (employers), and attempts to understand the resulting pattern of wages, employment, and income. Labour is a measure of the work done by human beings. It is conventionally contrasted with such other factors of production as land and capital. Some theories focus on human capital (referring to the skills that workers possess, not necessarily their actual work). There are two sides to labour economics. Labour economics can generally be seen as the application of microeconomic or macroeconomic techniques to the labour market. Microeconomic techniques study the role of individuals and individual firms in the labour market. Macroeconomic techniques look at the interrelations between the labour market, the goods market, the money market, and the foreign trade market. It looks at how these interactions influence macro variables such as employment levels, participation rates, aggregate income and gross domestic product. The labour force is defined as the number of people of working age, who are either employed or actively looking for work. The participation rate is the number of people in the labour force divided by the size of the adult civilian noninstitutional population (or by the population of working age that is not institutionalized). The non-labour force includes those who are not looking for work, those who are institutionalised such as in prisons or psychiatric wards, stay-at home spouses, children, and those serving in the military. The unemployment level is defined as the labour force minus the number of people currently employed. The unemployment rate is defined as the level of unemployment divided by the labour force. The employment rate is defined as the number of people currently employed divided by the adult population (or by the population of working age). In these statistics, self-employed people are counted as employed. Frictional unemployment – This reflects the fact that it takes time for people to find and settle into new jobs. Technological advancement often reduces frictional unemployment; for example, internet search engines have reduced the cost and time associated with locating employment or personnel selection. Structural unemployment – This reflects a mismatch between the skills and other attributes of the labour force and those demanded by employers. Rapid industry changes of a technical and/or economic nature will usually increase levels of structural unemployment; for example, widespread implementation of new machinery or software will require future employees to be trained in this area before seeking employment. The process of globalization has contributed to structural changes in labour markets. Natural rate of unemployment – This is the summation of frictional and structural unemployment, that excludes cyclical contributions of unemployment (e.g. recessions). It is the lowest rate of unemployment that a stable economy can expect to achieve, given that some frictional and structural unemployment is inevitable. Economists do not agree on the level of the natural rate, with estimates ranging from 1% to 5%, or on its meaning – some associate it with "non-accelerating inflation". The estimated rate varies from country to country and from time to time. Demand deficient unemployment (also known as cyclical unemployment) – In Keynesian economics, any level of unemployment beyond the natural rate is probably due to insufficient goods demand in the overall economy. During a recession, aggregate expenditure is deficient causing the underutilisation of inputs (including labour). Aggregate expenditure (AE) can be increased, according to Keynes, by increasing consumption spending (C), increasing investment spending (I), increasing government spending (G), or increasing the net of exports minus imports (X−M), since AE = C + I + G + (X−M). Neoclassical economists view the labour market as similar to other markets in that the forces of supply and demand jointly determine price (in this case the wage rate) and quantity (in this case the number of people employed). However, the labour market differs from other markets (like the markets for goods or the financial market) in several ways. In particular, the labour market may act as a non-clearing market. While according to neoclassical theory most markets quickly attain a point of equilibrium without excess supply or demand, this may not be true of the labour market: it may have a persistent level of unemployment. Contrasting the labour market to other markets also reveals persistent compensating differentials among similar workers. Models that assume perfect competition in the labour market, as discussed below, conclude that workers earn their marginal product of labour. Households are suppliers of labour. In microeconomic theory, people are assumed to be rational and seeking to maximize their utility function. In the labour market model, their utility function expresses trade-offs in preference between leisure time and income from time used for labour. However, they are constrained by the hours available to them. 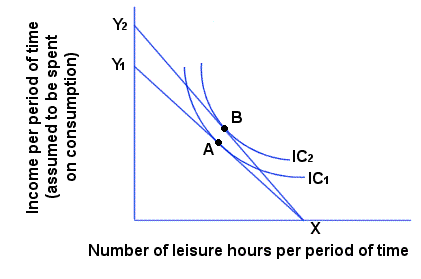 This is shown in the graph below, which illustrates the trade-off between allocating time to leisure activities and allocating it to income-generating activities. 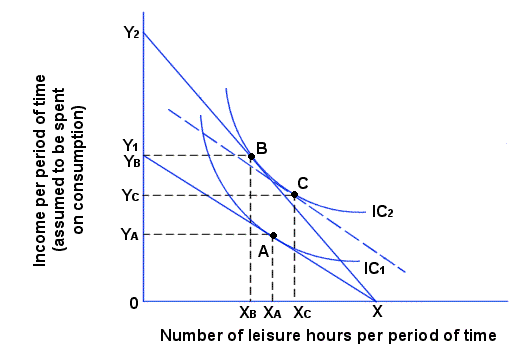 The linear constraint indicates that every additional hour of leisure undertaken requires the loss of an hour of labour and thus of the fixed amount of goods that that labour's income could purchase. Individuals must choose how much time to allocate to leisure activities and how much to working. This allocation decision is informed by the indifference curve labelled IC1. The curve indicates the combinations of leisure and work that will give the individual a specific level of utility. The point where the highest indifference curve is just tangent to the constraint line (point A), illustrates the optimum for this supplier of labour services. where Y is total income and the right side is the wage rate. If the wage rate increases, this individual's constraint line pivots up from X,Y1 to X,Y2. He/she can now purchase more goods and services. His/her utility will increase from point A on IC1 to point B on IC2. To understand what effect this might have on the decision of how many hours to work, one must look at the income effect and substitution effect. But that is only part of the picture. As the wage rate rises, the worker will substitute away from leisure and into the provision of labour—that is, will work more hours to take advantage of the higher wage rate, or in other words substitute away from leisure because of its higher opportunity cost. This substitution effect is represented by the shift from point C to point B. The net impact of these two effects is shown by the shift from point A to point B. The relative magnitude of the two effects depends on the circumstances. In some cases, such as the one shown, the substitution effect is greater than the income effect (in which case more time will be allocated to working), but in other cases the income effect will be greater than the substitution effect (in which case less time is allocated to working). The intuition behind this latter case is that the individual decides that the higher earnings on the previous amount of labour can be "spent" by purchasing more leisure. If the substitution effect is greater than the income effect, an individual's supply of labour services will increase as the wage rate rises, which is represented by a positive slope in the labour supply curve (as at point E in the adjacent diagram, which exhibits a positive wage elasticity). This positive relationship is increasing until point F, beyond which the income effect dominates the substitution effect and the individual starts to reduce the amount of labour hours he supplies (point G) as wage increases; in other words, the wage elasticity is now negative. The direction of slope may change more than once for some individuals, and the labour supply curve is different for different individuals. Other variables that affect the labour supply decision, and can be readily incorporated into the model, include taxation, welfare, work environment, and income as a signal of ability or social contribution. Labour demand is a derived demand; that is, hiring labour is not desired for its own sake but rather because it aids in producing output, which contributes to an employer's revenue and hence profits. The demand for an additional amount of labour depends on the Marginal Revenue Product (MRP) and the marginal cost (MC) of the worker. With a perfectly competitive goods market, the MRP is calculated by multiplying the price of the end product or service by the Marginal Physical Product of the worker. If the MRP is greater than a firm's Marginal Cost, then the firm will employ the worker since doing so will increase profit. The firm only employs however up to the point where MRP=MC, and not beyond, in neoclassical economic theory. The MRP of the worker is affected by other inputs to production with which the worker can work (e.g. machinery), often aggregated under the term "capital". It is typical in economic models for greater availability of capital for a firm to increase the MRP of the worker, all else equal. Education and training are counted as "human capital". Since the amount of physical capital affects MRP, and since financial capital flows can affect the amount of physical capital available, MRP and thus wages can be affected by financial capital flows within and between countries, and the degree of capital mobility within and between countries. According to neoclassical theory, over the relevant range of outputs, the marginal physical product of labour is declining (law of diminishing returns). That is, as more and more units of labour are employed, their additional output begins to decline. The marginal revenue product of labour can be used as the demand for labour curve for this firm in the short run. 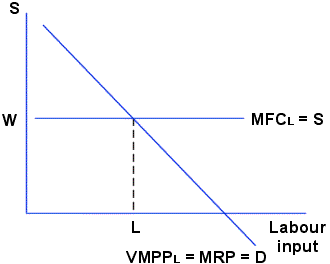 In competitive markets, a firm faces a perfectly elastic supply of labour which corresponds with the wage rate and the marginal resource cost of labour (W = SL = MFCL). In imperfect markets, the diagram would have to be adjusted because MFCL would then be equal to the wage rate divided by marginal costs. Because optimum resource allocation requires that marginal factor costs equal marginal revenue product, this firm would demand L units of labour as shown in the diagram. The demand for labour of this firm can be summed with the demand for labour of all other firms in the economy to obtain the aggregate demand for labour. 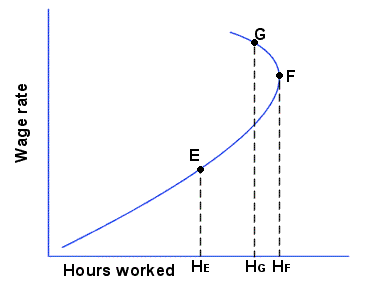 Likewise, the supply curves of all the individual workers (mentioned above) can be summed to obtain the aggregate supply of labour. These supply and demand curves can be analysed in the same way as any other industry demand and supply curves to determine equilibrium wage and employment levels. Wage differences exist, particularly in mixed and fully/partly flexible labour markets. For example, the wages of a doctor and a port cleaner, both employed by the NHS, differ greatly. There are various factors concerning this phenomenon. This includes the MRP of the worker. A doctor's MRP is far greater than that of the port cleaner. In addition, the barriers to becoming a doctor are far greater than that of becoming a port cleaner. To become a doctor takes a lot of education and training which is costly, and only those who excel in academia can succeed in becoming doctors. The port cleaner however requires relatively less training. The supply of doctors is therefore significantly less elastic than that of port cleaners. Demand is also inelastic as there is a high demand for doctors and medical care is a necessity, so the NHS will pay higher wage rates to attract the profession. Some labour markets have a single employer and thus do not satisfy the perfect competition assumption of the neoclassical model above. The model of a monopsonistic labour market gives a lower quantity of employment and a lower equilibrium wage rate than does the competitive model. In many real-life situations the assumption of perfect information is unrealistic. An employer does not necessarily know how hard workers are working or how productive they are. This provides an incentive for workers to shirk from providing their full effort – since it is difficult for the employer to identify the hard-working and the shirking employees, there is no incentive to work hard and productivity falls overall, leading to the hiring of more workers and a lower unemployment rate. One solution used recently[when?] – stock options – grants employees the chance to benefit directly from a firm's success. However, this solution has attracted criticism as executives with large stock-option packages have been suspected of acting to over-inflate share values to the detriment of the long-run welfare of the firm. Another solution, foreshadowed by the rise of temporary workers in Japan and the firing of many of these workers in response to the financial crisis of 2008, is more flexible job- contracts and -terms that encourage employees to work less than full-time by partially compensating for the loss of hours, relying on workers to adapt their working time in response to job requirements and economic conditions instead of the employer trying to determine how much work is needed to complete a given task and overestimating. Another aspect of uncertainty results from the firm's imperfect knowledge about worker ability. If a firm is unsure about a worker's ability, it pays a wage assuming that the worker's ability is the average of similar workers. This wage undercompensates high-ability workers and may drive them away from the labour market. Such a phenomenon, called adverse selection, can sometimes lead to market collapse. There are many ways to overcome adverse selection in labour market. One important mechanism is called signalling, pioneered by Michael Spence. In his classical paper on job signalling, Spence showed that even if formal education does not increase productivity, high-ability workers may still acquire it just to signal their abilities. Employers can then use education as a signal to infer worker ability and pay higher wages to better-educated workers. It may appear to an external observer that education has raised the marginal product of labour, without this necessarily being true. One of the major research achievements of the 1990-2010 period was the development of a framework with dynamic search, matching, and bargaining. At the micro level, one sub-discipline eliciting increased attention in recent decades is analysis of internal labour markets, that is, within firms (or other organisations), studied in personnel economics from the perspective of personnel management. By contrast, external labour markets "imply that workers move somewhat fluidly between firms and wages are determined by some aggregate process where firms do not have significant discretion over wage setting." The focus is on "how firms establish, maintain, and end employment relationships and on how firms provide incentives to employees," including models and empirical work on incentive systems and as constrained by economic efficiency and risk/incentive tradeoffs relating to personnel compensation. Many sociologists, political economists, and heterodox economists claim that labour economics tends to lose sight of the complexity of individual employment decisions. These decisions, particularly on the supply side, are often loaded with considerable emotional baggage and a purely numerical analysis can miss important dimensions of the process, such as social benefits of a high income or wage rate regardless of the marginal utility from increased consumption or specific economic goals. From the perspective of mainstream economics, neoclassical models are not meant to serve as a full description of the psychological and subjective factors that go into a given individual's employment relations, but as a useful approximation of human behaviour in the aggregate, which can be fleshed out further by the use of concepts such as information asymmetry, transaction costs, contract theory etc. Also missing from most labour market analyses is the role of unpaid labour such as unpaid internships where workers with little or no experience are allowed to work a job without pay so that they can gain experience in a particular profession. Even though this type of labour is unpaid it can nevertheless play an important part in society if not abused by employers. The most dramatic example is child raising. However, over the past 25 years an increasing literature, usually designated as the economics of the family, has sought to study within household decision making, including joint labour supply, fertility, child raising, as well as other areas of what is generally referred to as home production. The labour market, as institutionalised under today's market economic systems, has been criticised, especially by both mainstream socialists and anarcho-syndicalists, who utilise the term wage slavery as a pejorative for wage labour. Socialists draw parallels between the trade of labour as a commodity and slavery. Cicero is also known to have suggested such parallels. According to Noam Chomsky, analysis of the psychological implications of wage slavery goes back to the Enlightenment era. In his 1791 book On the Limits of State Action, classical liberal thinker Wilhelm von Humboldt explained how "whatever does not spring from a man's free choice, or is only the result of instruction and guidance, does not enter into his very nature; he does not perform it with truly human energies, but merely with mechanical exactness" and so when the labourer works under external control, "we may admire what he does, but we despise what he is." Both the Milgram and Stanford experiments have been found useful in the psychological study of wage-based workplace relations. The American philosopher John Dewey posited that until "industrial feudalism" is replaced by "industrial democracy," politics will be "the shadow cast on society by big business". Thomas Ferguson has postulated in his investment theory of party competition that the undemocratic nature of economic institutions under capitalism causes elections to become occasions when blocs of investors coalesce and compete to control the state. As per anthropologist David Graeber, the earliest wage labour contracts we know about were in fact contracts for the rental of chattel slaves (usually the owner would receive a share of the money, and the slave, another, with which to maintain his or her living expenses.) Such arrangements, according to Graeber, were quite common in New World slavery as well, whether in the United States or Brazil. C. L. R. James argued that most of the techniques of human organisation employed on factory workers during the industrial revolution were first developed on slave plantations. Additionally, Marxists posit that labour-as-commodity, which is how they regard wage labour, provides an absolutely fundamental point of attack against capitalism. "It can be persuasively argued," noted one concerned philosopher, "that the conception of the worker's labour as a commodity confirms Marx's stigmatisation of the wage system of private capitalism as 'wage-slavery;' that is, as an instrument of the capitalist's for reducing the worker's condition to that of a slave, if not below it." ^ Gustav Ranis (February 1997). "The Micro-Economics of Surplus Labor" (PDF). Yale University. ^ Hacker, R. Scott (2000). "The Impact of International Capital Mobility on the Volatility of Labour Income". Annals of Regional Science. 34 (2): 157–172. doi:10.1007/s001689900005. ^ De Meza ; Webb, David ; David (March 1990). "Risk, Adverse Selection and Capital Market Failure". The Economic Journal. doi:10.2307/2233604. ^ Spence, Michael (1973). "Job Market Signaling". Quarterly Journal of Economics. The MIT Press. 87 (3): 355–374. doi:10.2307/1882010. JSTOR 1882010. ^ Paul Oyer and Scott Schaefer, 2011. "Personnel Economics: Hiring and Incentives," ch. 20, Handbook of Labor Economics, v. 4B, pp. 1769–1823. Abstract and pre-pub . ^ Teixeira, Pedro N. Jacob Mincer: A Founding Father of Modern Labor Economics - Oxford Scholarship. doi:10.1093/acprof:oso/9780199211319.001.0001. ^ Thompson 1966, p. 599. ^ Thompson 1966, p. 912. ^ Ostergaard 1997, p. 133. ^ Lazonick 1990, p. 37. ^ "wage slave". merriam-webster.com. Retrieved 4 March 2013. ^ "wage slave". dictionary.com. Retrieved 4 March 2013. ^ Chomsky 1993, p. 19. ^ Thye & Lawler 2006. ^ Graeber 2004, p. 37. ^ Marx 1990, p. 1006: "[L]abour-power, a commodity sold by the worker himself." ^ Another one, of course, being the capitalists' alleged theft from workers via surplus-value. ^ Nelson 1995, p. 158. This Marxist objection is what motivated Nelson's essay, which claims that labour is not, in fact, a commodity. Richard Blundell and Thomas MaCurdy, 2008. "labour supply," The New Palgrave Dictionary of Economics, 2nd Edition Abstract. Freeman, R.B., 1987. "Labour economics," The New Palgrave: A Dictionary of Economics, v. 3, pp. 72–76. John R. Hicks, 1932, 2nd ed., 1963. The Theory of Wages. London, Macmillan. Orley Ashenfelter and David Card, ed., 2011, v. 4A & 4B. Mark R. Killingsworth, 1983. Labour Supply. Cambridge: Cambridge Surveys of Economic Literature. Jacob Mincer, 1974. Schooling, Experience, and Earnings. New York: Columbia University Press. Anindya Bakrie & Morendy Octora, 2002. Schooling, Experience, and Earnings. New York, Singapore National University : Columbia University Press. Nicola Acocella,Giovanni Di Bartolomeo and Douglas A. Hibbs, 2008, Labor market regimes and the effects of monetary policy, in: ‘Journal of Macroeconomics’, 30: 134–56. Glen G. Cain, 1976, The Challenge of Segmented Labor Market Theories to Orthodox Theory: A Survey Journal of Economic Literature, 14(4), pp. 1215–1257. Lindbeck, Assar; Snower, Dennis J. (1986). "Wage Setting, Unemployment, and Insider-Outsider Relations". American Economic Review. 76 (2): 235–239. JSTOR 1818771.